There are over 300 million tweets sent from around the world every day. And millions more search queries. Twitter is a source for news and conversations, so what is everyone talking about this week? Iran’s new President Hassan Rouhani has put recent focus on thawing previously tense relationships with the West. After his infamous meeting with US Secretary of State Kerry last week, it was revealed last Friday that Rouhani connected with President Obama over the phone – breaking a 3-decade-long silence between the countries’ leaders. “I reiterated to President Rouhani what I said in New York: While there will surely be important obstacles to moving forward, and success is by no means guaranteed, I believe we can reach a comprehensive agreement” – President Barack Obama. Upon Rouhani’s return from New York, he was greeted with hundreds of Iranians cheering for him and his peace efforts with the US. A smaller number of Iranians shouted the previously popular saying “Death to America,” however, many speculate that Rouhani’s outreach to Obama may kill the old saying and mentality. Australian Football League, or AFL has been trending across Twitter this past week especially after superstar Sydney recruit Lance Franklin (AKA Buddy Franklin) announced a blockbuster deal. Franklin announced after last Saturday’s Grand Final that he would be leaving Hawthorn to play for Swans Football Club for a historical $9 million contract. Footy fans took to Twitter to discuss his league-record-breaking contract, the club’s outrage over his announcement and how he’ll fare playing for the Swans. Tragedy struck a rickety fishing boat overloaded with hundreds of African migrants in search of a better life in Europe. A half-mile off the coast of the Italian island of Lampedusa, the boat started taking in water so a fire was lit onboard to catch another boat’s attention. However, as flames took over one side of the boat, passengers ran to the opposite side – a move that capsized the boat. Hundreds of passengers, including women and children who didn’t know how to swim were thrown into the Mediterranean Sea at night. Of the approximately 500 passengers were onboard, an estimated 300 people have been killed. The search has been postponed due to extreme weather. This event is one of the worst disasters of Europe’s immigration crisis and calls for meetings to discuss the thousands of migrants that arrive in unsafe vessels to Europe. Thousands of people looked to Twitter to send their condolences and listen for news updates. On Tuesday, the 2013-14 NHL season hit the ground running with three games and big celebrations. The Toronto Maple Leafs began the 96th season with a win over the Montreal Canadiens; the Washington Capitals faced off with the Chicago Blackhawks, while the Winnipeg Jets played the Edmonton Oilers. Let the games begin. Miss Philippines accepted her Miss World 2013 crown last Saturday in Bali, Indonesia. This normally smooth event was under tight-security after the contest was plagued by Muslim hardliner protests that threatened to disrupt the peaceful event. The show went on without a hitch, despite safety warnings from the West. Breaking Bad’s series finale had fans and critics around the globe singing the show praises and discussing alternative endings. Spoiler alert: Don’t Twitter search Breaking Bad unless you’re all caught up. 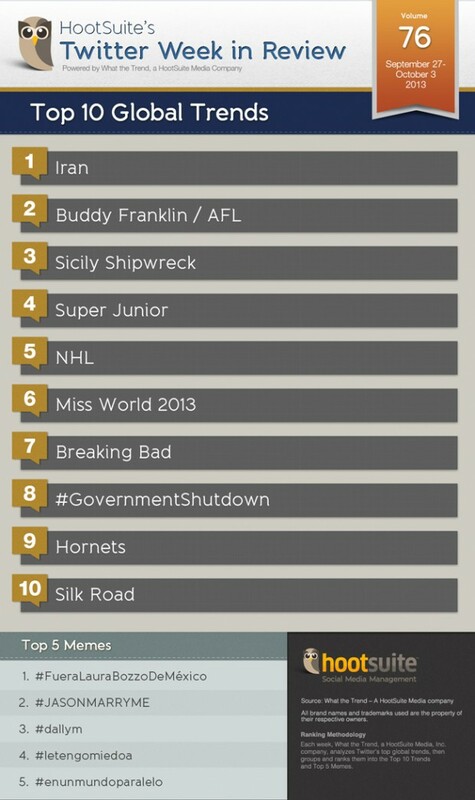 Americans have the partial shutdown of their government trending worldwide. The shutdown happened after the House and Senate failed to reach an agreeable Appropriations Bill, which would determine where government money is being spent for the next fiscal year. Many twitterers speculate that the implementation of Obamacare caused the refusal by Republicans, and ultimately led to the furlough of 800,000 workers and the closure of a number of government services. This apocalypse-like trend refers to China’s northwestern province of Shaanxi, which has had a recent unusual bout of deadly giant hornet attacks. Swarms of these human-thumb-sized hornets have killed 42 people and injured 1,640 in this region, an official news agency said last week. While authorities are warning the public and destroying nests, they turn to social media to help spread awareness and news updates. On Tuesday, the FBI arrested the alleged Dread Pirate Roberts, operator of ‘The Silk Road’ online black market site. American Ross William Ulbricht allegedly ran the site, which sold everything from drugs, guns and humans using digital currency – Bitcoin. In the site’s lifetime, an estimated $1.2B in transactions took place around the globe. Understandably, a discovery of this size had the world buzzing. Speaking of America, here’s what the US was tweeting about this week.